Moriah Cohen’s poetry has been published in Hayden’s Ferry Review, Hoot: A Mini Literary Magazine on a Postcard, Baltimore Review, and Narrative. She lives in New Jersey with her two sons. Paddling away into the sunset seems like a simple teenage escape fantasy, but no matter how fast the current or how wide the body of water, there is no erasing the horizon. Not unless the current pulls you under. Is suicide what “should have happened” instead of survival? Does she wish she’d succeeded? That’s one possible reading. The other: Persephone under the sway of pomegranate seeds, called across the river to the underworld, the summer grass already growing stale in anticipation of her departure. Either way our speaker is weary with experience and what she most wishes to convey—what has remained true among the falsehoods, is the desire to escape. The lightness of floating down a river needed to be reflected by the body’s typeface; Gill Sans is so uniformly thin it seems to skim the page. 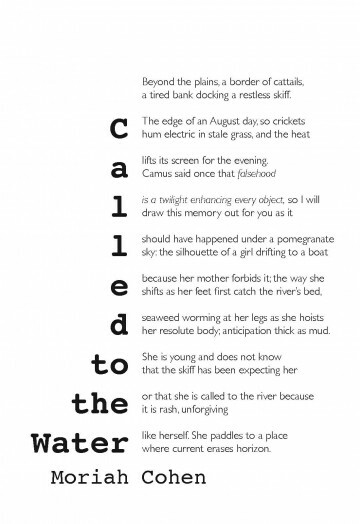 The title is stretched out to echo the river’s pull on the girl and boldface to show the strength of that pull. Courier’s serifs provide a more rooted feel, perfect for the river’s solid bank.